After attending a lecture of Cor, PA0CHN about testing the performance of HF receivers, I decided to make some test equipment to put my new DC Transceiver under test. For IP3 testing, I needed a dual frequency generator, so I built one myself by means of Cor’s design. Here you can see the result! 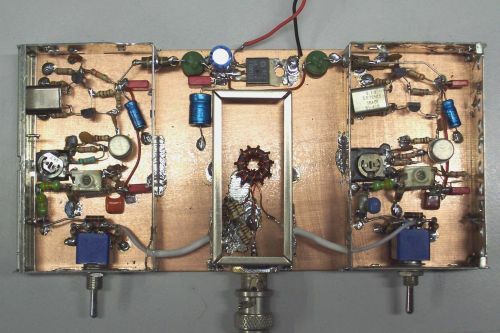 A dual tone generator with frequencies of 3579 and 3600 KHz, put together in a combiner and with exactly 0 dB output. The switches are for 20 dB attenuation of both generators. In the middle you can see the combiner.